When it comes to the Mega Duck and Sachen (here, once again operating under their 'Commin' pseudonym) we can usually be sure of one of two things, either the game in question will be a reinvention of a classic title or it will simply rip-off that classic wholesale. Street Rider is an example of the latter and it suffers for the lack of new ideas. In actual fact it's the 1980 Midway racing game Rally-X a game, only running at a significantly slower speed than that game did and on a screen that's significantly harder to see. If you're unfamiliar with the premise then imagine Pac-Man with racing cars, spread out over a vast scrolling map and with the collectibles scattered further and fewer between. Your job is to direct the car around the maze and hoover them all up without running into any of the enemy cars. As with Pac-Man, you sprite will continuously move in the last direction the player pushed, however instead of stopping at walls your car will bounce off them and continue in the opposite direction. Unlike Pacman there is no destroying the enemy cars, even temporarily, instead you can merely slow them down by pressing 'a' or 'b' to drop a limited supply of fuel on the road behind you. 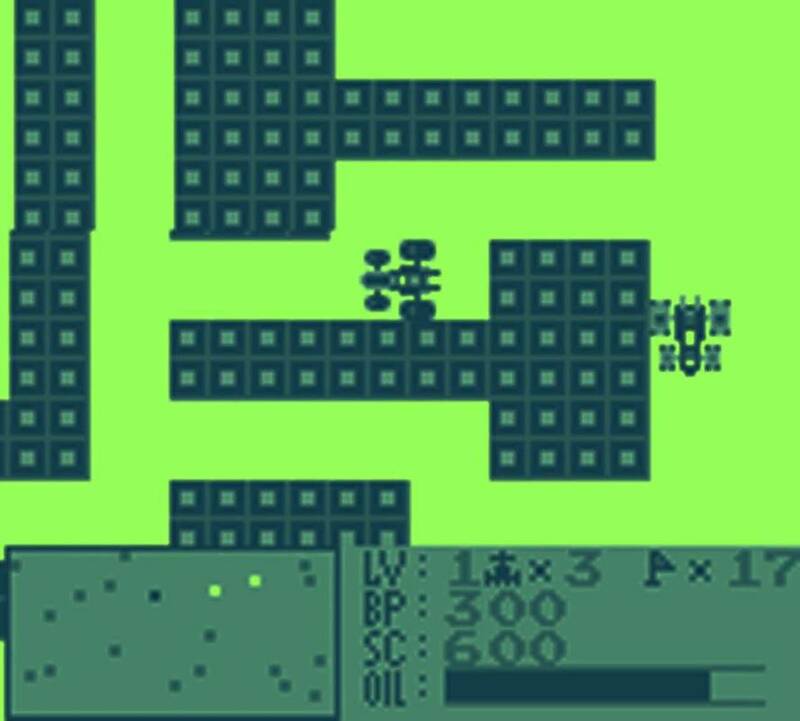 On each level there is also a flag that will double your speed, which is rather slow and sluggish given the premise. 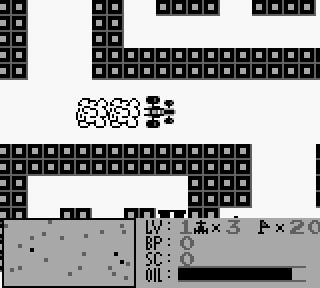 The extremely simplistic graphics are still 10x clearer here on this emulated screen-capture than they appear on the MegaDuck's often infuriating screen. Dropping oil behind you will temporarily slow down your pursuers....except when it doesn't for no explicable reason. That little disk is one of the 17 tokens still to find. Confusingly they are represented by a flag in the HUD and by an indistinguishable blob on the map. To avoid frustration the game's HUD displays a map that, theoretically, should help direct you to the tokens that you are supposed to collect. Unfortunately, due to the dark colour palette selected by the developer and the Mega Duck's less than clear screen it can be difficult to judge what is what on this tiny portion of the display. Ultimately, none of this matters as Street Rider, while a fairly faithful port, is still a fairly faithful port of a game that was already well over a decade old on release and is now well into its third decade and showing it. For a game about racing a car it's surprisingly slow paced and this, combined with the repetitive nature of its gameplay and the generic look of the stages means that it's almost as much a struggle to continue with it as it is to squint at at the map on the Mega Duck's screen. Musically, Sachen have done an outrageous job in plagiarizing Rally-X's theme tune and this alternates with other tracks throughout the stages but this isn't enough to bring about nostalgia for a game that never really captured the imagination in the way that Namco's little yellow dot eater did. 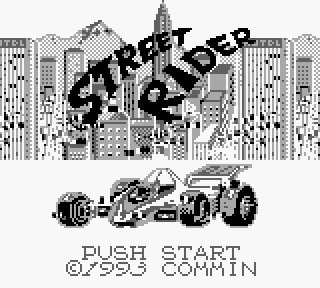 ​Street Rider does a reasonable job of cloning a popular although hardly legendary arcade game, however this is one instance where it probably would have been better to simply let the original ride off into the sunset.